In a few weeks' time, investors will have the information they need to place their bets going into 2018. In just a few weeks' time, investors in data center stocks will have the information they need to place their bets going into 2018. Third-quarter earnings are the last opportunity for data center company management to make a strong impression on investors heading into next year. And the sector will have gone through some big changes as it faces 2018. The most notable change from last quarter is DuPont Fabros Technology is no longer an investing option after its all-stock merger with Digital Realty Trust. Shares of Switch (SWCH) made a successful debut on the New York Stock Exchange Friday morning, at one point trading 44 percent above their $17 IPO price. Switch will now be added to our regular coverage here on DCK Investor Edge. Iron Mountain has expanded its data center services business rapidly. It will now have product offerings for investors to track in Denver and Manassas, Virginia; it also just announced a $100 million acquisition of two data centers from Credit Suisse in London and Singapore – its first expansion outside of the US. It’s important for investors in data center stocks to have some context as they look ahead to the final three months of 2017 and Q3 2017 results. Factoring in year-to-date performance is another part of the calculus. 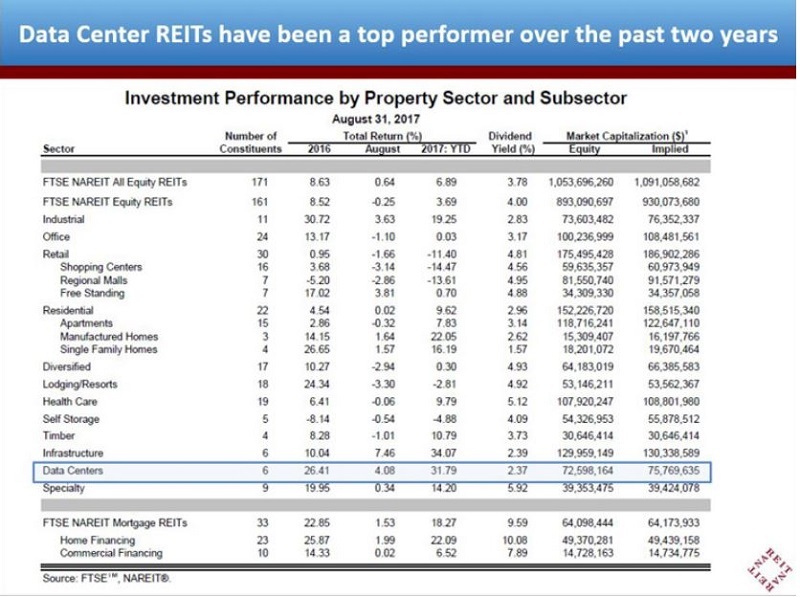 NAREIT economist Calvin Schnure recently penned an article highlighting data center REIT sector leading price appreciation for the past two years, at 26.4 percent for 2016 and 31.8 percent 2017 year to date (data through end of August). Schnure pointed out Cisco's forecast for continued growth of global IP traffic at a 20-plus percent CAGR (compound annual growth rate), shown below. While at the same time Schnure asked the question on everyone's mind: How long can this outperformance last? 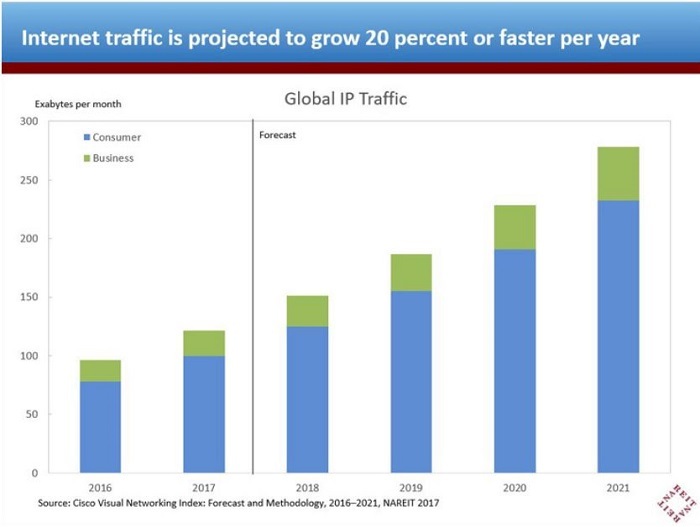 The global IP traffic growth rate directly impacts all the data center REITs. However, it clearly implies a continued tailwind for connectivity leader Equinix with its global platform of 180 IBX data centers and Equinix cloud exchange. Sector dividend blue chip Digital Realty Trust continues to roll out its Service Exchange software defined offering globally, which should help grow the steady interconnection results reported each quarter. Interconnection-focused CoreSite Realty -- active in just eight US markets -- has been able to put up gaudy results for shareholders over the past five years. Meanwhile, the growth in enterprise demand for hybrid IT solutions and connectivity to public cloud on-ramps also benefits CyrusOne and QTS Realty, despite not having "carrier hotels" as part of their portfolios. So the big question for investors in data center stocks remains: How long can double digit returns continue? 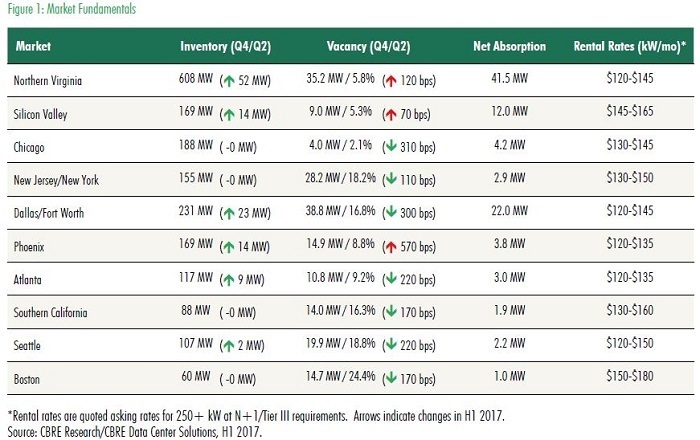 The recently published CBRE 1H2017 report helped shed some light on supply and demand fundamentals for wholesale data center space in the top US markets. 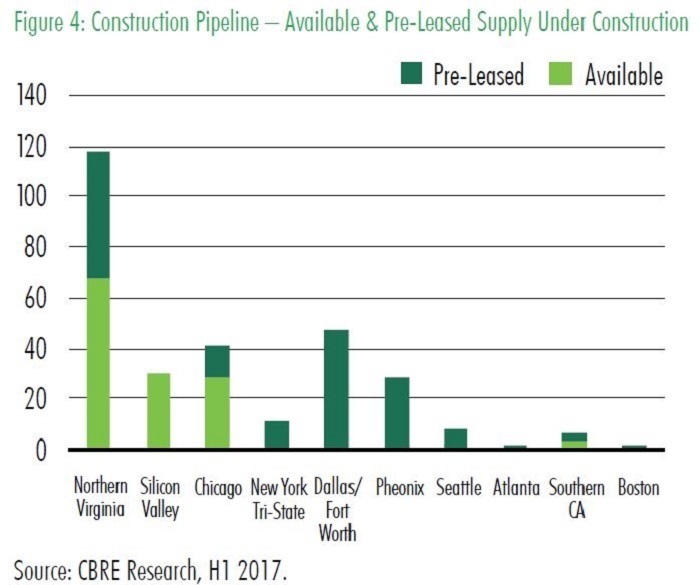 According to CBRE data, there was little vacancy reported in Silicon Valley, Chicago, and Northern Virginia, at just 2.1, 5.7, and 5.8 percent, respectively. These markets remain healthy with new supply and being in line with forecast net absorption. CBRE also noted a trend to more uniform pricing across the Tier 1 markets, as shown in the exhibit below. Looking one year back, there was a lack of wholesale product available in Northern Virginia and Dallas-Fort Worth. Today, that is the case in Silicon Valley and Chicago. However, there appears to be ample new development underway in both of those high-barrier-to-entry markets, which should bode well for 2018 deliveries. Wall Street tends to reward management teams that under-promise and over-deliver, and Digital Realty has a history of meeting or exceeding expectations under CEO Bill Stein. Investors will closely monitor quarterly results reported by Digital Realty regarding any color on DuPont Fabros Technology, the US wholesale business it just acquired. Last quarter, DuPont Fabros reported results, but management did not host a conference call pending the merger. Look for any hints from Digital management (formal guidance is unlikely) stemming from DuPont Fabros' wholesale leasing efforts, customer relationships, pipeline, and sales funnel. Notably, there are existing Facebook leases up for renewal in DuPont’s Ashburn, Virginia, facilities. It is unclear how Facebook’s recent announcement of plans to build its own data center in Richmond, Virginia, and a string of other in-house data center expansion projects announced earlier this year will affect prospects for lease renewals with DuPont. Updates on customer relationships with the top 10 cloud and SaaS providers will be important for all data center REITs. The long-term value of these customer relationships is becoming more apparent as planet-scale cloud providers look to incorporate preferred third-party landlords into their facility planning process. Inking new logos and expansions are crucial to long-term success. The strong fundamentals reported by CBRE in most major US data center markets should bode for the entire industry going forward. Data centers should continue to lead the way because of the strong tailwinds of cloud computing, hybrid IT, and outsourcing trends. Immediate leasing will help utilization rates and improve the metrics that matter most to investors: growing FFO/AFFO per share. However, investor should realize that wholesale leasing by its very nature is "lumpy," and a weak quarter can be erased with one hyper-scale lease inked the following month. Expect to see the considerable number of enormous powered shells being commissioned and new projects underway to have a headwind on some of the key metrics reported by smaller-cap REITs in the short term. Savvy investors will realize that lower ROIC on initial phases of new developments are baked into the cake. It is the price these companies pay to have the right product in place at the right time to provide the speed-to-market solutions for hyper-scale customers. Developing later phases is where the magic happens – cash-on-cash returns in the high-teens to mid-20 percent, or higher. Investors should consider buying the dips (if any), and remaining overweight in data centers, as there appears to be a long runway for continued growth across the board.